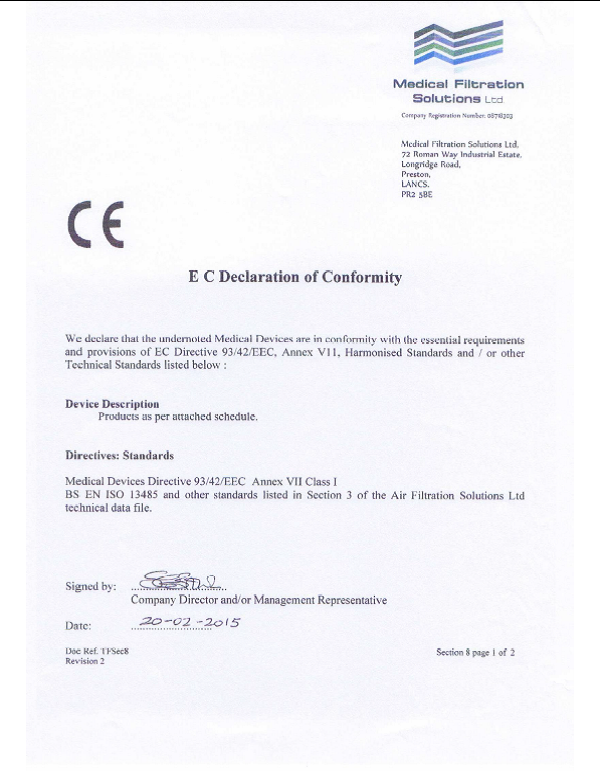 Medical Filtration Solutions Ltd (MFS), established in January 2014 require that the company takes the provision of quality seriously and ensures that all activities are performed to appropriate levels of efficiency it operates to a formal quality management system based as a minimum upon the requirements of ISO 13485, the Medical Device Directive 93/42/EC & FDA Good Manufacturing Practice as detailed in 21 CFR 820. 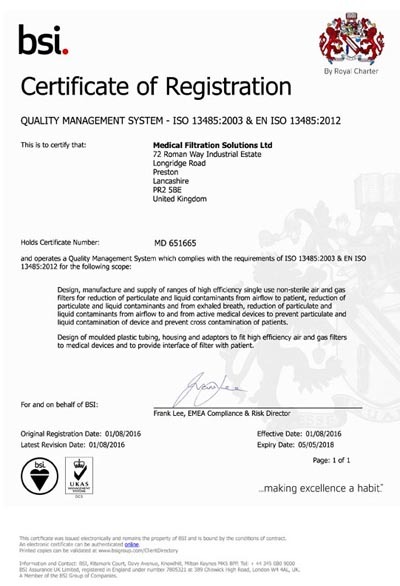 For ISO registration purposes the scope is that referenced on the current ISO 13485 certificate of registration issued by SGS Ltd. The company specialises in the design, manufacture and supply of range of high efficiency air/gas filters and associated products for respiratory, domestic and medical air filtration applications. Reduction of particulate and liquid contaminants from airflow to patient. Reduction of particulate and liquid contaminants and from exhaled breath. Reduction of particulate and liquid contaminants from airflow to and from active medical devices to prevent particulate and liquid contamination of device and prevent cross contamination of patients. Design of moulded plastic tubing, housing and adaptors to fit high efficiency air and gas filters to medical devices and to provide interface of filter with patient. The certificate is valid from 05 May 2015 until 05 May 2018 and remains valid subject to satisfactory surveillance audits. Re certification audit due before 14 April 2018 Issue 1. Certified since 05 May 2015.